Today we are doing an Indian dish. It is super easy and absolutely delicious- true soulfood. Anyway you can do a big pot and it eat several times, because it gets even better when reheated. This dish is inspired by a recipe from Jamie Oliver’s new book SUPER FOOD – Family classics. I got this book as a birthday present from my auntie and currently I’m trying out lots of recipes. Of course, I adapted this dish to our preferences and I also veganized it. First, you peel the potatoes and sweet potatoes and dice them evenly. Now you put them in boiling water and cook them until they are tender. It depends on the size of your cubes, how much time you need to cook them. As the next step you just drain them in a sieve and let the remaining water evaporate. Now you can cook the rice. Therefore you just put 150g of whole Basmati rice in a pot with a lid and add 300g of water. Once it comes to a boil, you add a teaspoon of salt and reduce the temperature to a simmer. Put the lid on your pot and let the rice cook for around 35 minutes at low temperature. Next, you can start with the curry. For this you first cut the spring onions into thin slices. Then you put a heaped tablespoon of coconut oil in a big pot and let it melt at low temperature. Now you raise the temperature and go in with the sliced spring onions, a tablespoon of Garam Masala and curry paste to your taste. When the spices start to smell, you add in the potato and sweet potato cubes and roast them until nicely browned. In the meantime you wash the spinach and cut it into fine strips. Then you add it to the pot as well. Now you can pour in the coconut milk and the chickpeas with all their liquid. Let the curry simmer until the rice is finished cooking and season to taste by adding salt, Garam Masala and curry paste. Before serving, heat up the wraps and cut them into quarters. 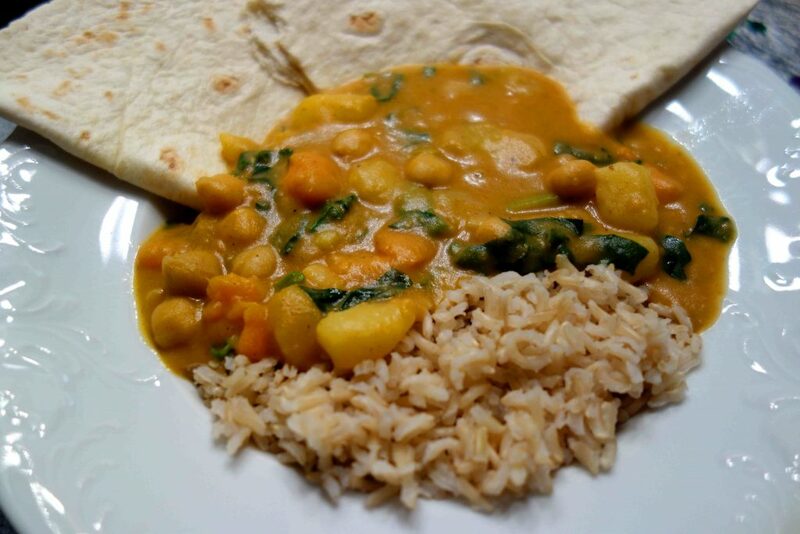 Then you add a bit of rice to your plate, two pieces of the precut wraps and top it of with loads of the delicious Saag-Aloo-Korma. Dinner is ready!